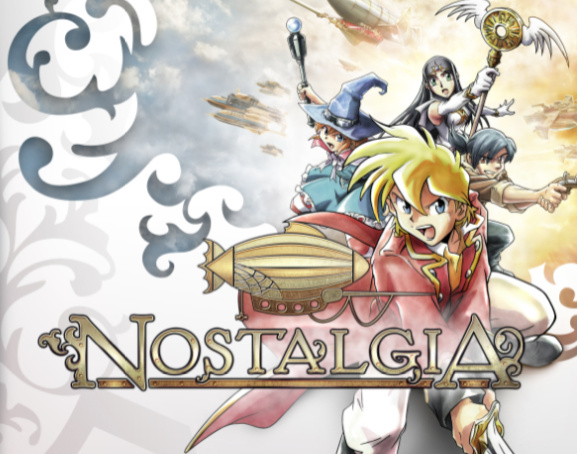 The official Nostalgia website has now gone live and has some great information about the game, not to mention some great music from the game's official soundtrack. You can also follow Nostalgia on Twitter or check out the Nostalgia Facebook page if you'd like to get a bit more involved in the happenings of the game. Here's a little information about the game taken from the official press release to give you a bit more insight into the game and some of its unique features. A brand new classic RPG that harkens back to the days of old-fashioned Japanese RPGs! Set in an alternate-reality version of 19th-century Earth, Nostalgia casts you as Eddie, a headstrong Londoner who amasses a group of memorable companions to traverse the world in his steampunk-inspired zeppelin. As you navigate the open skies, you’ll explore mysterious foreign locales, slay all manner of fantastical enemies, complete a variety of thrilling quests, and ultimately, save the world from unfathomable evil. Ambitious, fully 3D polygonal graphical engine offers dramatic, sweeping camera angles and impressive vistas rarely seen in a DS title. Cohesive, anime-inspired art direction that effectively captures the game’s turn-of-the-century charm. Travel to incredibly unique, non-traditional RPG locales via airship including London, New York, Cairo, Africa, and Russia. Features two distinct combat engines: One is a brisk, turn-based close-quarters melee between your party members and monsters; while the other offers thrilling, large-scale airship battles. In addition, your battle skills are scored at the conclusion of each conflict, inspiring strategic mastery. Handy in-game notebook feature keeps track of people, monsters, airships and items you've run across. Plenty of user-defined customization, allowing the player to trick out his or her airship with various weapons, armor types, and special skill attacks. The player can also choose character-specific skills from a branching tree for a more personalized experience. Explore a variety of diverse, engaging dungeons that include brain bending puzzles and tricky Indiana Jones-style traps. Optional quest system inspires players to approach the adventure from a less linear perspective, extending the life of the gameplay experience. We also got our hands on a fresh batch of screenshots that you can check out below and on the Nostalgia game page as well as the official trailer for the game if you somehow missed it the first time around. We'll keep you updated on any new information regarding Nostalgia and we'll of course have a full review of the game when it's released this September. Oh and we finally have the official box art in place now. Looks pretty sharp. I'm stoked about this one. As long as it doesn't play like Children of Mana, I'll be fine. True. Although a proper sequel to Skies of Arcadia would be nice. I doubt we're ever going to see a true Skies of Arcadia sequel, so I think this one will have to do. This game definitely looks cool! I really like the box art too! It is now on my must buy list! I'm not in love with the large head in-engine character style, but the rest of the game interests me. Doesn't look bad for a 3D game, I guess. Weird that it's not pixel art though considering it's supposed to hearken back to the old days of JRPGs. Still looks amazing. I'm definitely going to buy this one. Septemeber is looking to be a great month. Too bad I'll be at school and have no money. Yes! This is no doubt a must buy. If it's anything like Final Fantasy III I'm sure I will purchase it. Hopefully it will contain online multiplayer like Final Fantasy CC: Echoes of Time.